Kai Wet-Pommel is a ranking Nord soldier for the Stormcloaks. He can be initially found in the war room of the Jarl's Longhouse in Winterhold. If Winterhold is taken over by the Imperial Legion, he relocates to the Winterhold Stormcloak Camp. 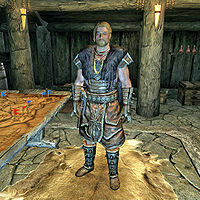 Kai wears Stormcloak officer armor along with a pair of matching boots and bracers. He either wields a leveled two handed weapon, which can be up to steel in quality, or a one handed weapon and a shield, which can both be up to steel in quality. In addition, he also carries a steel dagger and a hunting bow which he supplements with 12 steel arrows. This page was last modified on 26 March 2014, at 23:18.